So isn’t it always the case? I walk into Target to pick up a few things and suddenly my basket is full! I’m paying over $50 for things I didn’t really need. That box of facial tissue I initially came in for is buried under a load of stuff which includes a new cookbook. The cookbook? 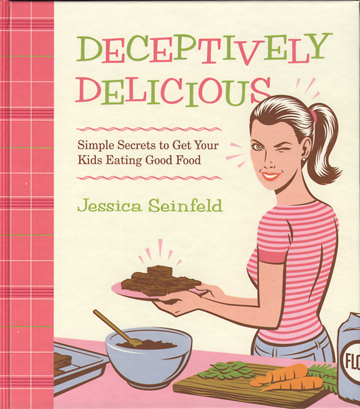 Jessica Seinfeld’s Deceptively Delicious: Simple Secrets to Get Your Kids Eating Good Food. The book has been sold out in San Diego bookstores. When I saw it on this particular visit, I picked it up without a thought. In all honesty, it was the jaunty design and interplay of pink and green design that lured me in. (Hey, I’m a page designer in real life.) Inside the cookbook, the retro design is further echoed and resembles a 1940s cookbook but without all the preprocessed crap. Hotdog casserole recipes in here? Nope. Instead there are recipes which include cooked, pureed fruits and veggies in everything from chocolate chip cookies (hello chickpeas) to rice balls (broccoli and sweet potato puree). I’m anxious to try some of these recipes on an unsuspecting victim and see if he notices the he’s eating veggies when he takes a bite of a brownie. Unfortunately, said victim has already seen the cookbook and knows of my nefarious plans. Ooooh, fun! I'm excited to hear how it all turns out! oooh, i've seen this before and filed it away as something to pick up when we finally have kids. i'm interested to hear the reviews on the recipes too. Design-wise it IS a cute book. I love retro stuff.Anyways, the topic of "how to get kids to eat" has been an on/off topic for most of this year at a mom-tot group I attend; the kids are 2-ish…I have "battled" with my 2-year-old for more than a year and I think we are reaching the light at the end of the tunne…For those of you who don't have kids yet, the reality: kids eat; nobody is starving to death. They just don't want to eat what mom thinks they should eat! It's a normal phase that all kids go through. No need to worry; continue to offer healthy options. Keep all meals and snacks balanced…One day they will surprise you and eat everything. My 5-year-old loves veggies like brussel sprouts, tofu, and garbanzo beans.Happy cooking! Is this Jerry's wife? i love the look of the book, too. i also laughed when i read about how you tried to sneak broccoli into Paul's mac 'n' cheese, too. Good one! i like the ideas of sneaking chickpeas into sweets. Super cool! Yes, please keep us posted because I've been tempted to buy this (to sneak veggies into my own diet). I have to admit, I've delayed in buying it due to "the controversy" but if you like it, I may change my mind. I saw that on the bookstore the other day. It looked interesting, but since Cat and I already love our veggies, I gave it a pass. Oh don't I know how that goes! Target is dangerous, but so great. It will be interesting to see what you think of the book!